Despite the health professions’ universally recognized duty to do no harm, doctors and psychologists have played a key role in the U.S. government’s policy of torture in its overseas prisons. They crafted and justified torture tactics, inflicted pain, oversaw abuse and enabled, covered up and turned a blind eye to cruel treatment. Yet, in the face of clear evidence, government officials, licensing boards and professional associations defend their failure to take action against health professionals who have participated in torture by claiming that they do not have enough information. The Center for Constitutional Rights disagrees and, through its When Healers Harm campaign, presented compelling evidence that supports the need for ethical, and in some cases criminal investigations of health professionals complicit in torture and other forms of abuse. Psychologists who were investigated include Dr. John Leso, a clinical psychologist trained and licensed in New York, who participated in the torture of Mohammed Al Qahtani and helped develop abusive interrogation techniques and detention conditions at Guantánamo Bay, and psychologist and retired U.S. Army colonel Dr. Larry C. James, a high-ranking psychologist and interrogations advisor for the U.S. military at Guantánamo Bay. Why “health professionals” and not “doctors”? The term “health professionals” refers to anyone who is trained or licensed in a healing profession. Medical doctors, including psychiatrists and medical examiners, are health professionals, but so are psychologists and nurses. All of these professions have been implicated in the torture and abuse of prisoners in CIA secret prisons and in military detention centers, such as those in Guantánamo, Afghanistan, and Iraq. Do we know for a fact that health professionals participated in torture and cruel, inhuman or degrading treatment of prisoners? For years, prisoners have alleged abuse by health professionals that amounts to torture and cruel, inhuman or degrading treatment (CIDT), and official documents (link to resources), now being disclosed in steadily increasing numbers, confirm their accounts that psychologists and doctors were essential to rationalizing and carrying out the government’s torture policy. In the case of force-feeding, policymakers openly acknowledge and defend the involvement of health professionals in forcibly feeding hunger striking prisoners, but question instead the charge that the practice is illegal and unethical. The force-feeding program at Guantánamo conflicts with the World Medical Association’s Malta Declaration on Hunger Strikers, updated in 2006 specifically to address U.S. policy at the Naval Base prison. How were health professionals involved in torture and cruel, inhuman and degrading treatment? turned a blind eye to cruel treatment. Did the abuse – and health professional involvement in it – end with the Bush Administration? Even today, under President Obama’s watch, Guantánamo physicians, nurses and prison guards continue to forcibly feed hunger strikers through the use of a 6-point restraint chair and the brutal forceful insertion and removal of thick nasogastric tubes. For many of the men in GTMO, solitary confinement, sensory deprivation, environmental manipulation and sleep deprivation are daily realities that have led to severe mental and physical suffering. Camp officials have refused to acknowledge clear suicide attempts. Instead, they classify them as “manipulative self-injurious behavior,” downplaying injuries and, in some cases, mental illness. Unless forced by court order, President Obama has denied prisoners access to independent medical experts and often even to their own medical records. Instead, the men are left to the exclusive care of medical personnel whom they distrust and who have a record of grossly mistreating and mismanaging the mentally ill. The Immediate Reaction Force (IRF), a team of military guards comparable to a riot squad, continues to beat men in response to allegations of disciplinary infractions and during unnecessarily brutal “cell extractions,” with no sign that health professionals are objecting to or reporting such abuse. It seems like many people were responsible. Why focus on health professionals, especially if they weren’t the ones at the very top? The relationship between patients and health professionals is based on trust, and torture survivors can feel particularly violated when those professionals participate in their abuse. Some develop fear and mistrust of all health care personnel that leads them to avoid seeking the mental and physical treatment vital to their recovery. Health professionals, most of whom take seriously their commitment to do no harm. 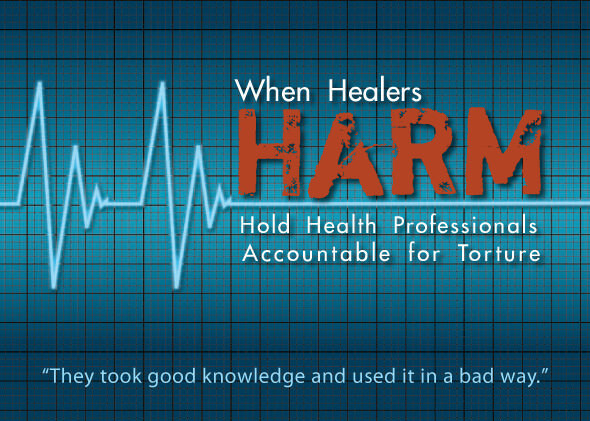 Torture by health professionals, particularly when not adequately addressed by the professional associations, ultimately corrupts the profession itself. The rest of us – as patients and members of civil society, we have a right to treatment by health professionals who we can trust, and a right to a government that upholds the law .